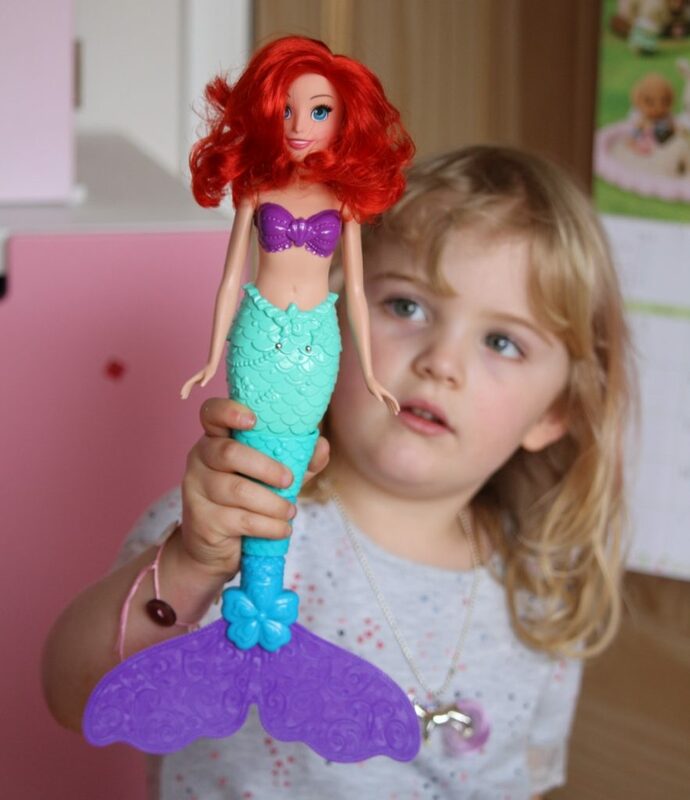 Two years ago, we bought a ‘Spin and Swim’ Ariel Doll for our daughter to keep her amused on a flight; The Little Mermaid being her favourite of all the Disney Princess films. The doll was supposed to, as the name suggested, swim and spin through the water hands-free but basically it was rubbish (sorry, but it was). The tail fell off all the time, it was tricky to wind up and all the bits got lost within about 7 minutes. Having read the reviews on Amazon, I was not alone in my frustration. She still loves the stupid thing, even without a tail, but it doesn’t swim. We thought we’d try again with the Swimming Adventures Ariel from Hasbro. In many ways the two dolls are similar, unsurprisingly. 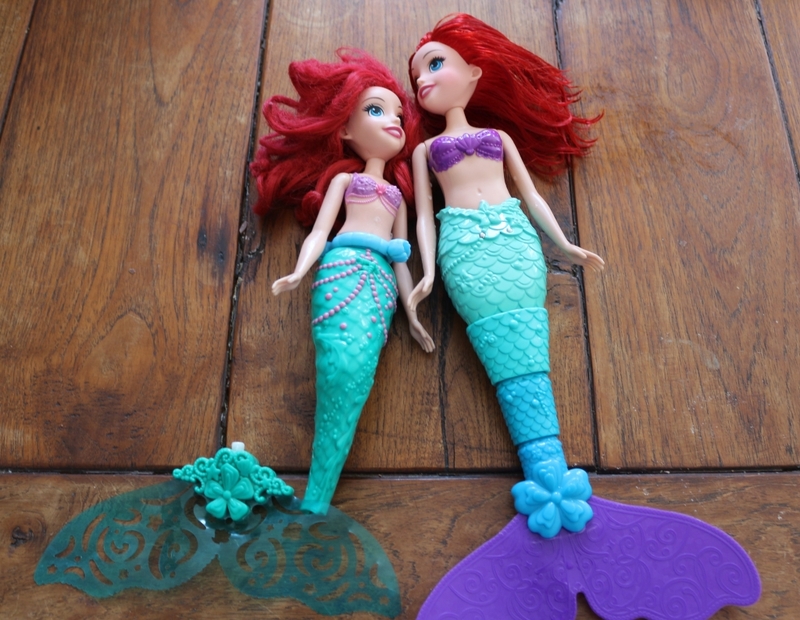 Both have the signature Ariel big eyes and brushable hair (although poor old Spin and Swim Ariel’s hair is beyond help), her recognisable purple bikini and a a green mermaid’s tail. However the Swimming Adventures Ariel is different in a few ways. Firstly, her tail fin, although separate in the box and requiring assembly, don’t fall off all the time. It’s also less flimsy although still quite thin bendable plastic. Secondly, she needs two AAA batteries to work (not included) which sounds promising. She’s also slightly bigger and heavier due to the battery compartment. How does Disney Princess Swimming Adventures Ariel work? 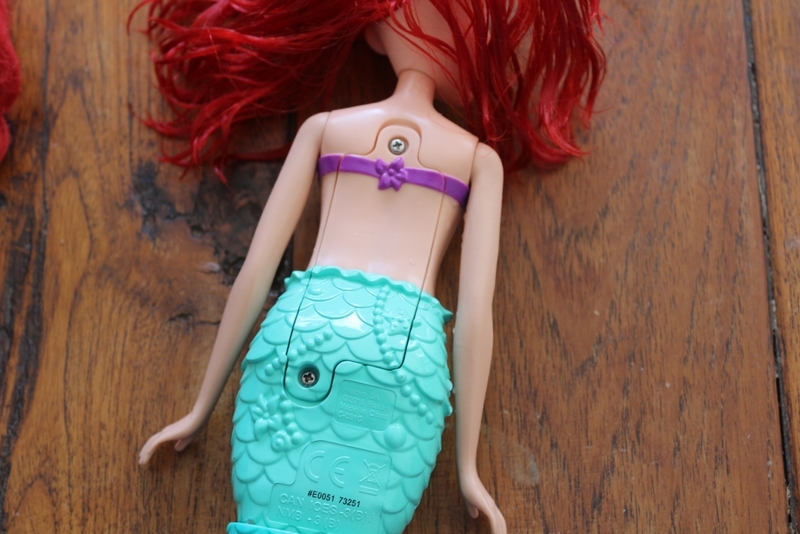 Once you have inserted the batteries, when the contacts on the front are submersed under water, Ariel will splash her tail forwards and backwards for 45 seconds. 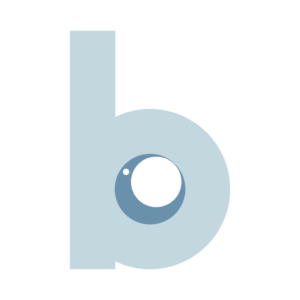 When placed down at the bottom of the bath, her tail will propel her up to and along the surface of the water. She doesn’t swim fast, or necessarily in a straight line, but she does move. You can also get her to splash her tail when out of the bath by making the connection with your fingers. To make her swim again, you need to break the circuit by drying the contacts off and place her back into the water. 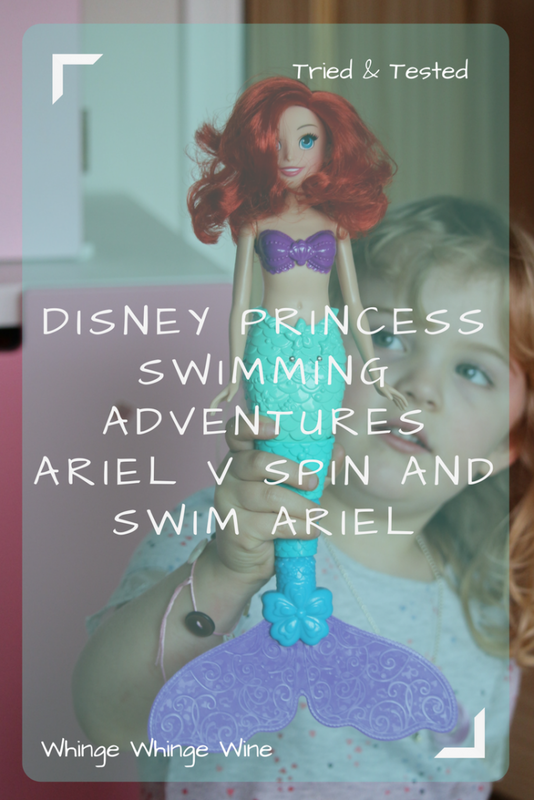 What did we think of Swimming Adventures Ariel? She’s much better than the last model, the tail and body is better and more robust, there are no pieces to lose, nothing to wind up and the fact she can actually swim is a huge bonus. I’m a little worried about how thin the tail fins are; I hope they won’t tear or break with use. However all in all she is a welcome addition to my oldest’s ever-expanding Disney Princess collection and a great bath time toy. 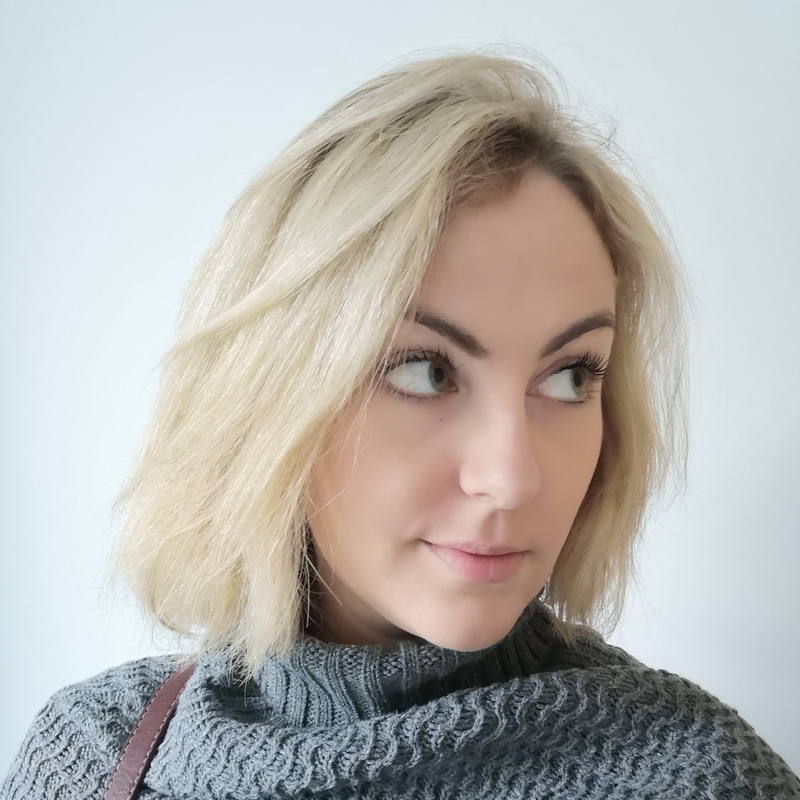 Quick tip: Make sure you have a sharp pair of scissors and get her out of the box carefully, she is held in with plastic tags and you need to snip these off without cutting the hair! Make sure you have 2 x AA batteries on hand to avoid disappointment! You can purchase the Disney Princess Swimming Adventures Ariel doll from large toy shops or via Amazon here. It retails at £24.99 and is for children aged 3+. 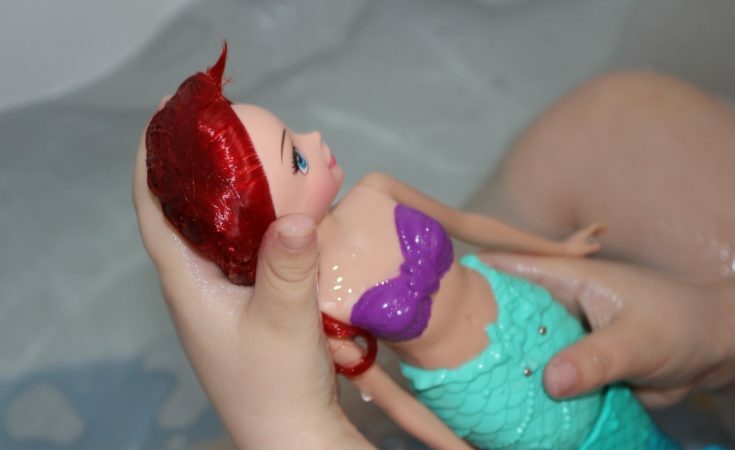 We were sent Disney Princess Swimming Adventures Ariel to review as part of the Hasbro Toy Tribe. All pictures and words are my own.